WM Filter is a family owned business established in 1989 based in Naples, Florida and Rockville, Maryland. We proud ourselves on excellent customer service while offering clean, good and pure drinking water and environmental friendly air products. 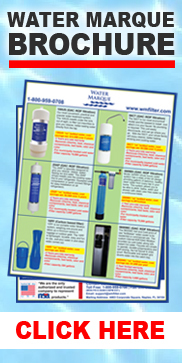 All of the Water Marque water filters are made in the USA and have NSF certified components. Please be advise we do sell items that are not manufactured in the USA. WM Filter is the ONLY authorized and trusted company to represent NSA products and has been manufacturing their air and water commercial line products for over 20 years. Effective January 1, 2008 NSA Inc. officially turned over the Air and Water replacement program to WM Filter (Water Marque). NSA Inc. has 25 year plus relationship with WM Filter (Water Marque). All NSA Air and Water replacement products can be ordered through WM Filter at 1-800-959-0708. All of the Water Marque water filters are made in the USA.